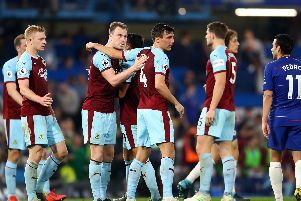 While the loss of striker Sam Vokes for the first half of the season was a big blow for Burnley, his absence was keenly felt by Wales as well. But, with the key component of last year’s promotion side back in tandem with strike partner Danny Ings for the Clarets, he is itching to wear the red dragon on his chest again - almost a year to the day since a serious knee injury ruled him out for nine months. Vokes is back in Chris Coleman’s Wales squad for their critical Euro 2016 qualfier in Israel on Saturday (5 p.m. kick-off), as the surprise Group B pacesetters face off. And he said: “It’s great to get called up again. “It’s obviously nearly been a year since I was involved and playing with Wales, so it’s a great feeling and I’m looking forward to the game. Wales are unbeaten in their first four games in the group, and lie a point behind Israel, who have won their first three – as they leave World Cup finalists Belgium and Bosnia and Herzegovina trailing so far. Vokes added: “With the injury, it was tough to take with the lads doing so well, that’s when you want to be involved and in and around the group.